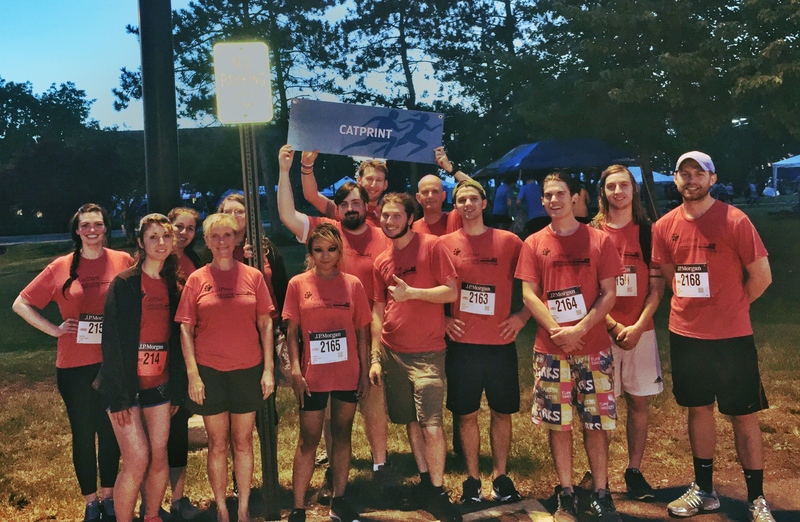 This year, CatPrint participated in the Chase Corporate Challenge for the second year in a row, organized by our favorite Cat-Sprinter, Laura! We sat down with her to learn more about her experience with the Chase Corporate Challenge, and her tips and advice for companies that are considering on participating in the Corporate Challenge! How did you hear about the JP Morgan Chase Corporate Challenge? I don’t exactly remember how, but I organized the Chase Corporate Challenge for two years back when I worked at Staples. So when I started working at CatPrint, I thought it would be cool to organize it here, too! What are your recommendations for companies registering for the first time? Make sure you get everything on time as the organizers of the Chase Corporate Challenge are not flexible with payment or deadlines. You should also have a Team Captain that is responsible and motivating, who will push employees to both sign up and show up to the race. Make sure to decide who pays for the registration fee for the race, as there is the option to choose if the employer pays for it, or if the employee will have to pay for it themselves. Make sure that if you want a tent site, register for the tent site early. Tent sites go by fast, and you might get a spot you end up not liking. If your company wants to wear the same t-shirt design to show conformity, and are also entering the t-shirt design contest, make sure to do that early! Finalize the design for submission to the contest, and also send it to your t-shirt printer as soon as possible. What is your favorite thing about the Corporate Challenge? It is nice to get together with your co-workers and hang out with them outside of work. The Corporate Challenge is like company cookout combined with a race. What is the worst thing about the Corporate Challenge? The worst thing is probably the weather. Every year on the race day, it seems that there is a thunderstorm on the day of, which means mosquitos. No one likes being bitten by mosquitos. How did you come up with the design for the T-Shirt Contest? I asked people in the company for recommendations, and Kevin said “cheetah”. So then I came up with a design fitting for CatPrint: a cheetah made of paw prints. How many times have you participated in the Corporate Challenge? Combining the years I did it at Staples along with CatPrint, I have done the Corporate Challenge 4 times now! How was this year’s challenge compared to last year’s challenge? CatPrint had a bigger turnout this year with almost double the amount of people we had last year, which was pretty cool. We were also faster than last year, and placed better as a team. 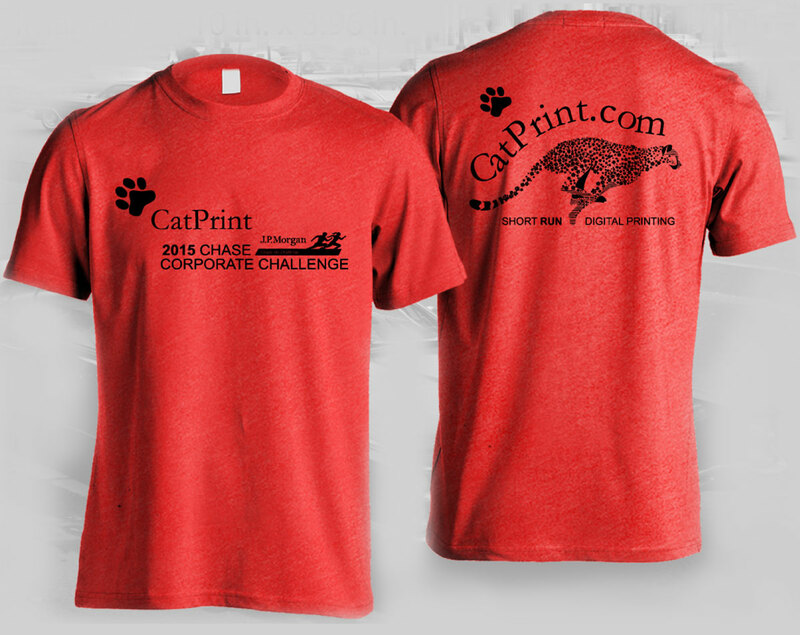 In the case that you have interest in participating in the Chase Corporate Challenge, or would like to bring it up to your company, CatPrint researched more on the challenge to break it down for you! The Chase Corporate Challenge is a series of 3.5 mile races in cities across five different continents. Companies sign up with a team captain, and employees sign up through their companies. The registration fee is paid for either by the employee or by the company. Each city has either one or multiple beneficiaries that are nonprofit organizations. Teams are created during registration. There are three separate divisions of teams: Female, Male, and Mixed. In all three categories, the top four times from each company’s team are combined to make one time, which is what will be used in determining the competitive race times. For the Mixed Teams, the top 2 female and top 2 male are considered. This means that in a way, teamwork is involved! So if finishing the race is not enough motivation for you, then know that your teammates are relying on you to get your fastest time possible. Thousands of participants sign up every year! For Rochester’s 2015 Corporate Challenge, there were over 10,000 participants from 421 companies! What cities are involved in the Chase Corporate Challenge for 2015?